If you’re having a bad day, you can at least be thankful you weren’t responsible for this massive screwup. 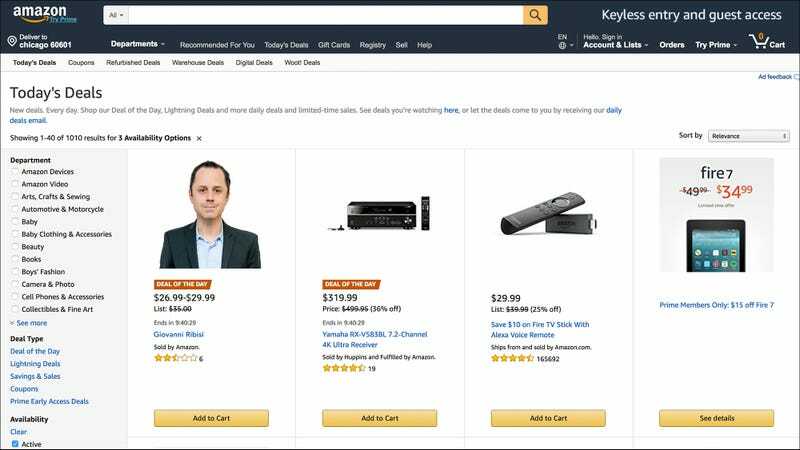 Amazon Studios was forced to pause production of Sneaky Pete after a database error led to lead actor Giovanni Ribisi mistakenly being sold as the Amazon Deal of the Day. Yep, someone is cleaning out their desk as of right…now. The massive mistake was noticed after YouTube user Glorysnoutx9 posted a video where she unboxes Giovanni Ribisi and claims that she was able to snag the Sneaky Pete star for only $42.66 on Amazon’s Deal of the Day page. The user claims that the lead actor of the offbeat Amazon Studios dramedy was accidentally available for sale for just a few seconds before she snagged him using the “1-Click Ordering” button, and that she is very happy with her purchase. This is 100 percent on Amazon. You just can’t blame someone for buying Giovanni Ribisi for that price, and unfortunately it’s the Sneaky Pete fans who have to pay the ultimate price. As the shooting of season three of the whipsmart show falls more and more behind schedule by the day, Amazon has tried in vain to get the buyer to return Ribisi, offering her a full refund and a free year of Prime. Making matters worse for the e-commerce giant, even if Giovanni is returned, several hundred people were able to put him on backorder before Amazon realized its error and pulled the plug on his listing. It’s unlikely the show will return any time soon unless someone ends up putting him on eBay. Terrible. Stories like these are a reminder that in today’s world, even a tiny error can have disastrous consequences. Sorry, Sneaky Pete fans, guess you’ll just have to be satisfied with the cliff-hanger finale of season two!